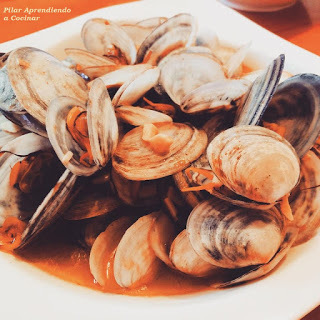 We are back to the kitchen to cook and share with you this great recipe, “Clams in Smoked Spicy Paprika Sauce”, really delicious. Don’t forget to enjoy these clams with your favourite bread for dipping! Once you start eating them you will not be able to stop. We share now this yummy and easy recipe with you. * To begin with let's put the clams in a bowl of salted water and let it stay for two hours. * Then we will remove them from the water and rinse them well. We drain them and put them aside. * In a frying pan we add the oil and let's start to sauté the onion finely chopped, then the minced garlic and when everything is fried we will add the flour, stir, toast it a little and then we add the paprika, and continue stirring. * We add then the white wine and the bay leaf, cook for a few seconds and then add the clams. * We will stir them and we will cover the pan. We continue cooking for a few minutes until the clams open. * Once we take them away from the fire, we will add chopped parsley finely diced and ready to serve at the table and enjoy. ."